As a movie, "The Devil Inside" is a failure. As a horror movie, it's a scare-free bore. But as a test of the audience's willingness to put up with being jerked around for an hour and a half, "The Devil Inside" is a resounding success. Never before have I attended a movie after which every single audience member made his displeasure known with some sort of verbal outburst, some of which I cannot repeat here. (Must think of the children.) I'd heard stories of audiences being so angry with "The Devil Inside" they threw popcorn at the screen — which means they were really mad, 'cause theater popcorn ain't cheap. That didn't happen at the screening I attended, which is a shame. That would have been entertaining. As I recall, my own response at the time was something like, "That wasn't very good, now was it?" That's an understatement. "The Devil Inside" will make you angry. Any hope I'd had that it would be "so bad it's good" faded in the first 20 minutes. This is a film that combines two overused horror tropes — exorcism and "found footage" — and makes something less than the sum of the parts. There's even a dash of "Da Vinci Code"-style Vatican conspiracy paranoia thrown in for bad measure. I almost feel bad for reviewing this movie. It's like drowning a puppy because it's too dumb not to poop on the rug. The movie starts in the 1980s, with 911 recordings and police video taken from the scene of a triple homicide. The slaughter, it turns out, was committed by a woman (played by the aptly named Suzan Crowley, in the film's only credible role) who may or may not be possessed by the devil. (Go ahead. Guess.) Flash forward to the present day, and the woman is, for reasons that vaguely make sense only if you assume a vast Vatican conspiracy rules the world, incarcerated in an asylum next door to the Vatican in Rome. Her now adult daughter Isabella (Fernanda Andrade) is making a documentary about Mom and exorcisms. Assisting her is a filmmaker (Ionut Grama) whose purpose is to hold the camera and be a jerk. (In these movies, the guy holding the camera is always a jerk.) During her quest, Isabella sits in on — and films! — an exorcism class. Turns out, Vatican-authorized exorcisms are really boring, and, as it happens, two rogue priests whom Isabella meets agree. The priests (Simon Quarterman and Evan Helmuth) have been performing unauthorized exorcisms on the side because the church is too busy covering up demonic possession to be of any help. Naturally, the priests decide to tag along for a fateful meeting with Isabella's mom. After tricking the world's dumbest hospital staff into leaving them alone in an examination room with Isabella's mom, our four heroes confirm their worst suspicion: Mom is possessed not by one demon but by five. If you can add, you can figure out the rest. That's the problem. There is nothing the least bit surprising about "The Devil Inside." Even the attempted scares are telegraphed well in advance. And the ending manages to be even less satisfying than anything in the "Paranormal Activity" franchise. It's no wonder people want to throw things afterward. Writer/director William Brent Bell and co-writer Matthew Peterman have reached the rock bottom of the found footage genre. The whole contrived exercise seems like an excuse to take a trip to Rome — and then it rained the entire time. Maybe they were just taking their disappointment out on the audience. "Tucker and Dale vs. Evil" is a romantic comedy masquerading as a horror spoof in which various college-student stereotypes meet grizzly ends. If you like horror movies but are tired of horror clichés, it's a nice way to spend an evening. But if you feel empty the next morning, it may be because of a nagging sense that "Tucker and Dale" could have been so much more. "Hillbilly horror" is one of the most used and abused sub-genres of horror. City slickers go to the woods or the mountains or the middle of nowhere and run afoul of the natives — inbred, possibly cannibalistic rednecks wielding meat hooks, axes and chain saws. From "The Texas Chainsaw Massacre" to "The Hills Have Eyes" to "House of 1,000 Corpses," it's a family tree without a lot of branches. But "Tucker and Dale" diverges from the norm. This time, the rednecks are the heroes. Dale (Tyler Labine) and his best and probably only friend Tucker (cult favorite Alan Tudyk of "Firefly") are just two good ol' boys minding their own business. They're on their way to Tucker's new fixer-upper cabin in the woods, a not-so-palatial spread Tucker insists on calling a "vacation home." On the way, they pick up supplies at one of those absurdly well-stocked country stores that exist only in movie depictions of country stores. (This is part of the genre, so roll with it.) While there, they encounter an SUV full of college students, who happen to be on the way to party it up at another nearby cabin. This is somewhat breaking with tradition, because cabins in these movies normally don't have close neighbors. Anyway, the students — probably having seen all of the horror movies I named, plus "Deliverance" — are immediately suspicious of Tucker and Dale. After they get to their cabin, and after a few ghost stories and beers — ghost stories being something college students tell only in movies — the college kids decide it's a good time for skinny-dipping. Except they keep their underwear on, because skinny-dipping no longer means what it did when I was in college. At this point, a student named Allison (Katrina Bowden of "30 Rock") falls, hits her head and is rescued by Tucker and Dale, who are fishing nearby. When Allison's friends assume she has been kidnapped by those two scary rednecks, a hilariously tragic series of misunderstandings follows. Each of the kids' attempts to "rescue" Allison ends with one or more of them painfully dead, and Tucker and Dale become convinced the college kids are part of a suicide cult. If this sounds like a cool idea with a heartwarming message about not judging people by appearances, it is — as far as it goes. I hope everyone learns a valuable lesson about not looking down on hillbillies. 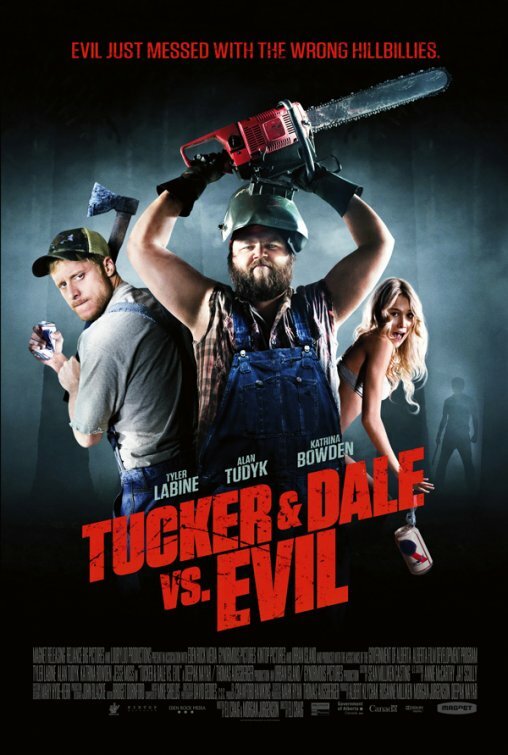 But while "Tucker and Dale" fights the evil of stereotyping rednecks, it embraces just about every other movie cliché. Writer/directer Eli Craig and co-writer Morgan Jurgenson saddle Allison with two-dimensional friends, which at least has the advantage of letting us not care when they die. And the movie saddles us with a standard-issue romance between a hopelessly mismatched pair: namely Dale and Allison. If there is any genre more deserving of being subverted than hillbilly horror, it's the romantic comedy about a couple of opposites who overcome their differences — and plot contrivances — to find love. We've all seen "Lady and the Tramp." Enough already. 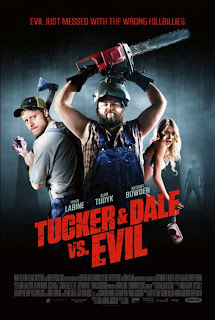 For what it is, "Tucker and Dale" is a fun movie, even if it does underuse its greatest asset, leaving Tudyk to sit out most of the final reel. Yet, "Tucker and Dale" is a missed opportunity. Maybe it's too much to expect two hillbillies to deal with more than one evil at a time. Mavis Gary is no serial killer, but she's undoubtedly Charlize Theron's most despicable character since she won an Oscar for "Monster." Mavis is narcissistic, selfish and — ultimately — delusional. That's bad for her but great for us. Fortunately, Mavis is the kind of despicable that is fun to watch. Most of the time, anyway. Directed by Jason Reitman from a script by his "Juno" collaborator Diablo Cody, "Young Adult" is a romantic comedy waiting to happen. All the pieces are there: a woman returning to her rural hometown from the Big City, an old high-school flame, a former classmate/confidant. We've seen it a thousand times — usually with Reese Witherspoon in the starring role — and Mavis knows the fairy tale cliché only too well. But "Young Adult" is not a rom-com. Instead, it's a slightly dark and refreshingly pointed reversal of the lazy, insulting rom-com formula. After graduating high school, Mavis left her "hick" town for a bustling metropolis — in this case, Minneapolis, where she found modest success as a writer of young adult novels. But with her deadline to turn in the series' final volume looming, Mavis has a sort of premature mid-life crisis, set off by an email announcing the birth of her high-school boyfriend's new baby. By all accounts, Buddy (Patrick Wilson) is happily married to his wife, Beth (Elizabeth Reaser), but that fact and the couple's new bundle of joy are just minor complications for Mavis, who returns to her hometown with her laser sight on winning Buddy back. All she has to do is look her best — not a problem for someone who looks like Charlize Theron — inflate her resumé and convince Buddy they are meant to be together. It's just like in the movies. The only person fully aware of Mavis' insane scheme is Matt (Patton Oswalt), a classmate Mavis virtually ignored in school, although it's subtly implied Mavis might be indirectly (and unknowingly) responsible for the brutal hate crime that left him crippled in more ways than one. Matt is a geek who shares a house with his dorky sister, makes custom action figures and — in an unorthodox twist — distills bourbon in his garage. He tolerates Mavis only because he's had a crush on her since high school. As he says during a scene where both are indulging their neediness, guys like him always fall for girls like her. For the rest of us, Mavis is a hard character to like, and yet Theron still manages to make her sympathetic during fleeting moments, conveying hints of fear behind tired, hungover eyes. There's a real person behind Mavis' self-created, cartoon-character exterior, which evokes at times Paris Hilton, complete with a little dog tucked away in a shoulder bag. "Young Adult" subverts the typical romantic comedy's clichés by always doing the opposite, but it subverts other Hollywood clichés, too. It says: "Most people are pretty happy. Family life can be fulfilling. Life in small-town America isn't all bad." Maybe those things aren't for everyone, but they're valid choices. The quiet suburban desperation of "American Beauty" says more about screenwriters than it does about the suburbs. Despite centering on a miserable protagonist, "Young Adult" is a strangely optimistic film. In Reitman and Cody's neighborhood, most people are doing OK. When Mavis drives her trendy Mini Cooper through her old stomping grounds, wrinkling her nose at the chain stores and the combination KFC/Taco Bell/Pizza Hut — a Frankenstein restaurant that reeks of tackiness — she's not actually showing off her good taste. She's just being a snob. Everyone's happy except Mavis and the people like Matt who are unlucky enough to fall for her.